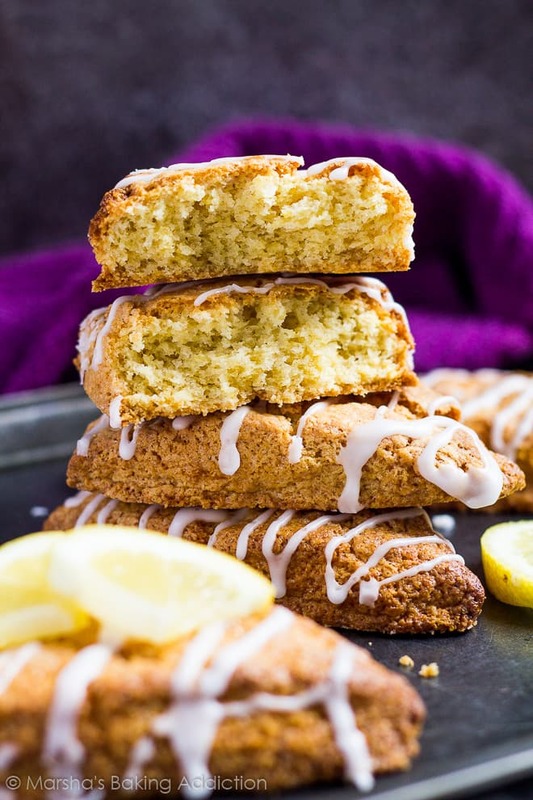 Lemon Drizzle Scones – These scones are deliciously soft and fluffy on the inside and crispy on the outside, infused with lemon and drizzled with a sweet lemon glaze! Another lemon recipe over here! 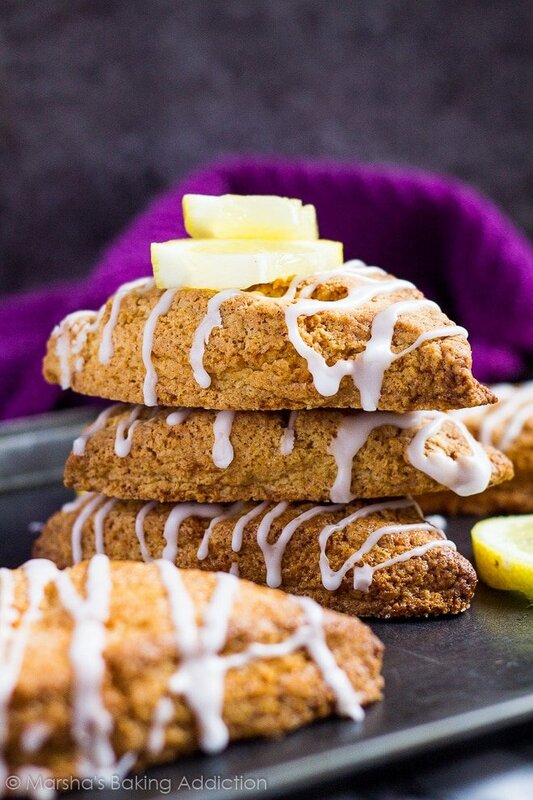 I’m hoping you enjoyed my scrumptiously creamy and tart Lemon Bars, because today I bring you a lemon infused breakfast/brunch recipe – Lemon Drizzle Scones. Who doesn’t love a scone or two with their morning tea or coffee? These scones are super quick and easy to throw together and bake. Simply whisk together all your dry ingredients, then rub in the butter until the mixture resembles coarse breadcrumbs. Whisk together the wet ingredients, and add to the breadcrumb mixture. Fold together to form a soft dough, then turn the dough out onto a floured surface. Shape into a circle and cut out 8 wedges. Bake them at 200C/400F for 20 – 25 minutes, and you’re done. To make the glaze, simply whisk together the icing sugar and lemon juice. Drizzle or pour over the warm scones, and devour! 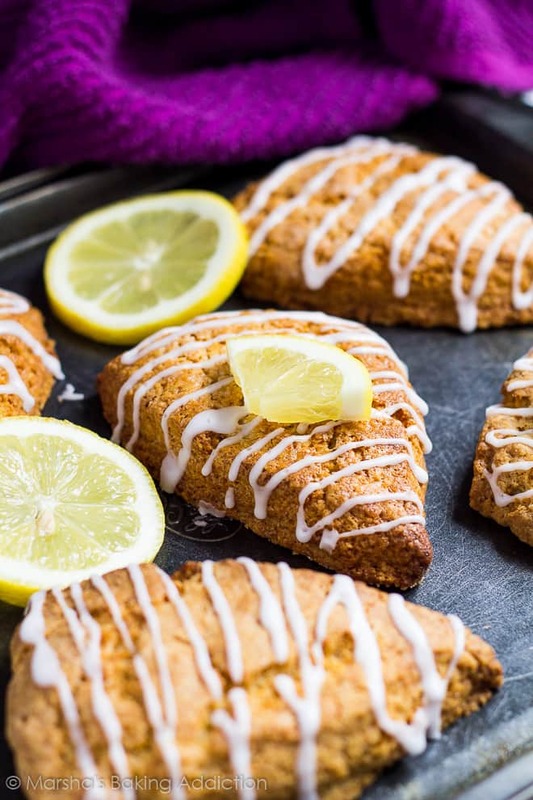 These scones are deliciously soft and fluffy on the inside and crispy on the outside, infused with lemon and drizzled with a sweet lemon glaze! In a large bowl, whisk together the flour, sugar, baking powder, salt, and zest. Add the butter and, using a pastry cutter, fork, or your fingertips, work it into the mixture until it resembles coarse breadcrumbs. You may also use a food processor. In a separate bowl, whisk together the egg, cream, and lemon extract until combined. Pour into the flour mixture and gently fold in until a soft dough is formed. Do not overmix. Whisk together the icing sugar, extract, and milk until smooth and slightly runny. Add more milk if the glaze is too thick, or more icing sugar if too runny. Drizzle over warm or room temperature scones, and enjoy! I really love lemon flavored desserts. It’s perfect for welcoming spring, right? These scones look delicious Marsha. Wish I have one slice waiting for me in the morning to complement my cup of tea. Lovely photos as always! 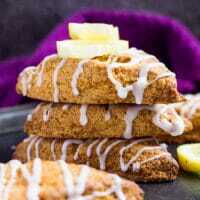 I love scones and lemon is starting to be a beloved flavor. I love the photos. Hmmm, did you hand make that scarf in the background? Very pretty. The scones look tasty and I’ll be trying them soon! These sound absolutely wonderful! I absolute love lemon flavored treats this time of the year! Gorgeous photos! These look so tasty. 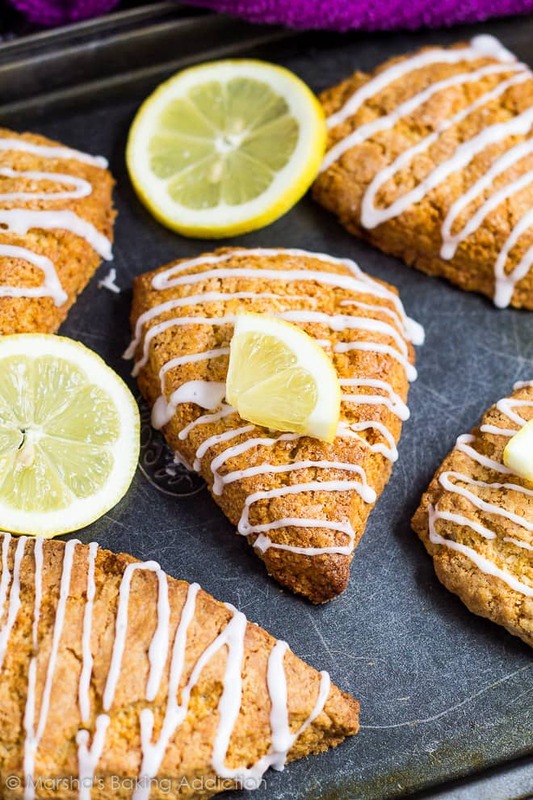 Yummy, the aroma of freshly baked scones….these look amazing, and I love the lemon icing!